First order of business today was to confirm our seats for tomorrow’s train to Prague. It’s a 7hr trip and we did not want to find ourselves sitting one behind the other. 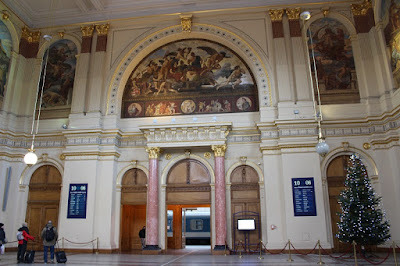 We caught the metro to the main Keleti station and found ourselves at a very different part of the station from where we’d first seen on arrival on Wednesday. While still in need of ongoing TLC – the main entrance is actually gorgeous and the metro platforms are all modern and very clean. Seats sorted we took the metro back to the last station before the Danube so we could visit St Stephens Basillica. It had been on yesterday’s Pest itinerary but we spent so much time at the National Museum that we ran out of time. Named in honour of Stephen, the first King of Hungary (c 975–1038), whose supposed right hand is housed in the reliquary, it was consecrated in 1905 having taken 54 years to build. Having seen the interior I am not surprised. Opulent doesn’t come close – coloured marble, gold leaf, a gorgeous painted domed ceiling and an utterly spectacular portrait of the Black Madonna. We had a quick look through the Christmas Market setup in the forecourt but the howling wind made it a less than pleasant time so we headed for the Chain Bridge and our way across the Danube. Well rugged up against a really feral wind, we walked across the bridge stopping in he middle for the fantastic views back to the Pest side. The line for the funicular up to the castle was long and slow moving but we had no desire to trudge up the hill so we sucked it up and shuffled along till it was our turn. Built in 1870, destroyed during WW2 and re-built between 1975 – 85 it takes 24 passengers at a time up a 30deg hill in just over 90 seconds. The views were fantastic despite the wind. Once we got out into the castle grounds, the sound of drumming caught our attention. The changing of the guard outside the Sandor Palace (the official residence of the President of Hungary) was pretty cool. It was pointless trying to find somewhere out of the wind so we tightened our scarves and headed out along the terrace for more incredible views across the Danube. At the end of the end of the terrace we went down the stairs and had a look round some of the old parts of the original castle area. 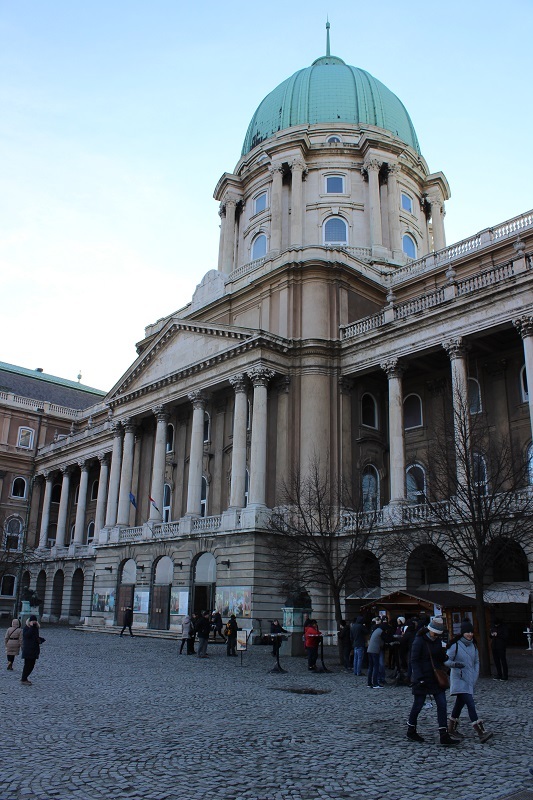 Like so many other European castles, Buda Castle was always a work in progress. The oldest parts date from around 1300 but in the intervening years every king, queen, emperor and invader has added bits, destroyed bits, rebuilt bits – its impossible to describe all the building and rennos in a few lines. It has been home to Ottomans, Austrians, Hungarians but the massive Baroque palace we can see today was built between 1749 and 1769. The latest destructions happened during the Seige of Budapest in 1945. Work is ongoing and we saw current reconstruction of the stables which when finished may well look like its been there for 300 years. 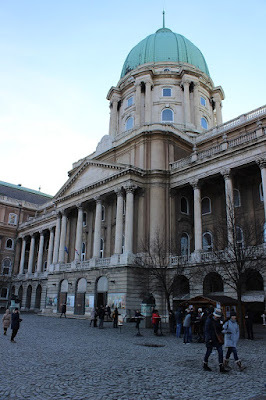 The castle houses the National Library, the Budapest History Museum and a swathe of government offices. Out of the castle confines and into the ‘town’ part of Castle Hill (hehe) through some really lovely pretty streets (there you go with the two faces thing again) and a lunch stop before heading towards St Matthias Church and the gorgeous Fishermans Bastion which sits atop the steep hill down to the Danube and provides mazing views of the Parliament building across the river. We wanted to see Parliament House lit up at night, and with sunset just after 4pm we didn’t have long to wait. We took a walk round the top of the castle walls past City Hall, the Mary Magdalene Tower (all that remains of a 14th century church bombed in 1945) and back to the Fishermans Bastion to find a falconer waiting to part tourists from their forints. We stopped for some afternoon tea and headed towards the Bastion. The early evening views are spectacular. Back to the Pest side by #16 bus and a beer (and a meat & cheese platter for dinner) at the Longford Irish Pub and we headed home. Weary and a bit footsore but delighted with todays touristing. Those damn two faces again – gorgeous Buda, grubby Pest (except for the areas right close to the Danube) but acknowledging that Hungary has only been a democracy since 1990 and their financial pie has a lot to go round.… Budapest you’ve surprised us. Thanks! Did Beerman visit any Ruin Pubs while there? We have intentions of visiting a few of them this October, as well as a night time Bath Party.